I remember when I read the Secret Garden for the first time. I was in elementary school and it was part of the Accelerated Reader program. 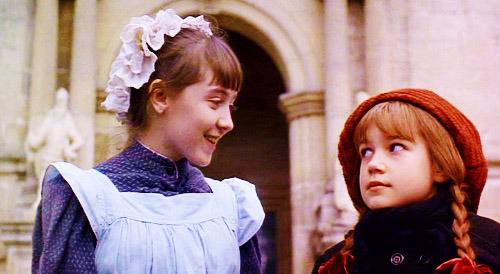 I in particular remember how rotten Mary seemed to everyone in the book. The kids made fun of her and poor Martha, the serving girl at Misselthwaite Manor, had to deal with her bitchy little temper. But even while reading that book and wishing more than anything in the world that I was Mary Lennox and would be shipped off to England to live in a big cold dark castle before Harry Potter was even a thing, I didn’t see Mary as a mean kid, or a bad one. The Mary Lennox vibe was consistently given off by those of us in foster care as well. We were always labeled as troublemakers or sour or what have you. I was actually accused of scaring my foster parents so badly that they wrote the judge a letter saying they feared for their life. Luckily the judge rolled his eyes and ignored their pleas for salvation, but the heavy cloud that followed me around still gave off the impression that I was bad or to be watched. For what, I have no idea. Killing foster parents in their sleep apparently. I was always assumed to be far worse tempered than I actually was. Just like Mary, I had “bad” students when I was a teacher. I wasn’t even nervous when I took over the trouble-making rowdy classroom, despite one of the students being so “bad” that he was almost kicked out of the school and was basically on his final warning. Everybody was breathing down his neck when I took over…his parents and the entire facility were just watching and waiting for his final mess-up. I came into the class and while yes, he was a loud and uncensored and spirited and emotional kid, he was the farthest thing from bad in the universe. Within a few months I was being praised for the “good job I did” on turning things around with the bad gang and their bad gang leader. I didn’t do anything, I didn’t wave a personality wand over his brain and fix it. He was a good kid. He wasn’t mean. It wasn’t like he was pulling birds’ wings out or sneaking ex-lax into the principal’s cup. (For real that’d be funny though) There were no serial killer cues from him, just like there were none from me when I was in foster care. These days, as an adult, I don’t know if I can be considered a Mary Lennox. Like I talked about a few entries ago, I have accepted that I’m different and have to wear a Clark Kent human costume in order to fit into society–for better or worse. I’m no expert at it but I think I have being human down pretty well, I can pass so seamlessly now that others often say “I can’t imagine you not being social!” or “You’re so social!” No, I’m a faker, I hate all of you, and you’re annoying, go away and leave me to the garden. But instead of expressing that, I smile and nod and say thanks, and by that token I’m no longer a sour grape eating orphan. Outwardly. I guess a part of me will always be that though, internally at least. There’s a lot of pain and hurt and mistrust and anger and displacement, all those things that Mary felt when she was carted off to cold musty England, brewing inside my overcrowded brain. I can sense it in other children too, which is why the “problem” kids did so well in my class. I let them have their pain, express it openly, and I set very clear expectations concerning respect of classmates to protect them from any raised eyebrows or stares or judgement. Kids are far better at respecting these rules, and somehow my own acceptance of students’ pain allowed them to be relaxed and content in the class and make friends, instead of disrupting everyone or pushing back harder. Actually, the boy I’m writing about quickly became a de-facto ‘class leader’ not only for his own age group, but an advocate and caretaker of the younger students. He intervened when others were bullied and he encouraged everyone regardless of age to play together. This reinforces that ideal which is so important to me…everyone has bad in them. Bad thoughts, bad feelings, the will to punch over a produce wall at the supermarket just to watch cucumbers roll across the floor. I will never understand why this is frowned on in favor of our Clark Kent masks. I know my class was a closed unit and I’m biased, but our little community full of acceptable negative emotion and “bad” people from students to the teacher, functioned quite well. Mary ended up finding her family and happiness, and we’ll assume she grew up to be a productive member of society. I assume she had to don a human mask too. And that’s just fine. This post was part of the 8 Minute Memoir project. Thanks Bonnie!